Due to the drastic transformation in the media landscape Social Media has surfaced and has become widespread as it is growing rapidly in the last couple of years, totaling the number of active social media as of January 2015 to account for 2.08 billion worldwide according to Statista.com. Businesses’ accelerating investments in Social Media, especially in in Facebook, is the status quo right now. Yet, a lot of firms still do not perceive social networks to be a vehicle for gaining customer loyalty. These companies perceive social networks to be a source for generating brand awareness. A different view was added to this discussion of Social Media by researchers Gamboa & Goncalves (2014), who did a case study on Zara and their use of Social Media as a source towards building and enhancing customer relations. On the social network site Facebook, Zara classes in their respective category of fashion brands, as having one of the largest number and most valuable fans. This study showed that companies could increase customer loyalty through building upon important factors such as trust, customer satisfaction, perceived value, and commitment. 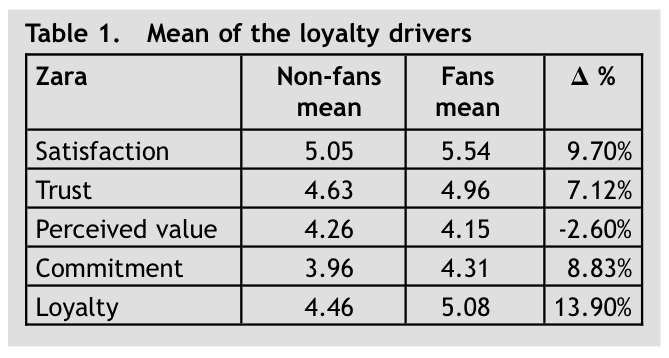 Fans as well as non-fans of brand on Facebook were used in this research and it showed that relations are more improved for Facebook fans of the brand compared to the non-Facebook fans, showing that the most important cause of loyalty is customer satisfaction, as seen in Table 1 below. For businesses, the greatest task is forming a personal relationship with the consumer, similar to the interaction of them with their friends on Facebook. A company’s Facebook brand page must be a “place” where consumers can dialogue with the brand as well as be part of a community. The old-school era of only focusing on commercial goals has ended, as the important of a relational context is a definite requisite for companies to survive in Web 2.0. Businesses that desire to attain customer loyalty must have a priority in seeking customer satisfaction. Customer satisfaction is the most important driver with the most positive (direct and indirect) effect on fans’ loyalty. The social network site, Facebook is a communication channel that can increase consumers being more satisfied, and as a result of this, can create deeper client-brand relationships. However, as customer satisfaction is an outcome of the consumer being fulfilled of created expectations, brands on the social networking site should be quick and transparant in answering their Facebook fans’ questions. The most crucial element is frequent interaction as well as maintaining an active and dynamic presence on this platform. Being dynamic and interactive with fans are essentials in making consumers come back, trust a brand, and be satisfied. Creating content (such as quizzes or poll questions) that encourages fans’ active behavior is also essential, and it can also serve as a mean to gaining knowledge about customers’ opinions regarding the brand. Facebook to serve as a stand-alone tool. Customer questions or critiques should receive answers very quickly. When consumers are forced to use other methods to come in contact with the company, it will increase customer dissatisfaction. Content relevance of the brand page is important. Only sharing brand advertisements or internal information not be effective. Content sharing such as news, funny updates, suggestions suggestions for the weekend or holidays are great ways to achieve engagement. Identify target group and their interests. Specifically targeting consumers while sharing content will increase customer satisfaction, trust, and commitment. Create exclusive content. Such as games or applications for Facebook fans. Consumers love campaigns that propose advantages to them and posting exclusive content via Facebook will create alertness of the Facebook Fans to the brand page and as a result they will become loyal. Always be professional, yet never boring. Brans will lose fans if they consistently post advertisements, post too much, too few or post irrelevant information. Brands can communicate with consumers by by integrating Facebook into their marketing strategy. The expectancy is that Facebook will maintain and even increase its effect by 26%. In this current landscape of web 2.0 and social media with substantial growth margins, businesses should start being very active on Facebook by maximizing the benefits of it and by captivating brand loyalty in the online world. Reference: Gamboa, A. M., & Gonçalves, H. M. (2014). Customer loyalty through social networks: Lessons from Zara on Facebook. Business Horizons, 57(6), 709-717.